‘Chivalry’ is a historical can of worms that tests the patience of the most diligent historians. Producing even a conservative description of the knight and the martial ethos of Chivalry is a major challenge. Doing so for that most abstract of audiences, the educated general reader, is intimidating. The many varied features of Chivalry are tightly twisted into a confusing knot of religious, political, cultural, material, and technological influences all bound into a collection of contradictory literary and historical sources. We struggle to grasp what parts of the historical record reflect what Chivalry was, in reality, and what was simply the myth and fiction that the martial and social elites believed about themselves. Chivalry is defined by what knights thought they were, what they thought they should be, and the historical reality of their actions. Considering these challenges, Robert Jones has written an accessible introduction to this complex concept, while taking enough care in his language to avoid the generalizations and simplifications that tempt writers of general surveys and plague the study of knights and martial elites. Jones also manages to add something new to the well-stocked market of general history books on medieval warfare. Much of the content in the book will be familiar to readers in this area, but Jones provides an updated account, incorporating some recent work in the neglected areas of training and martial practice. 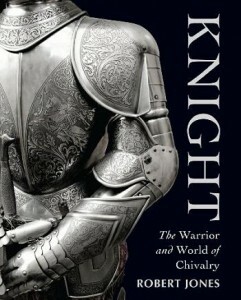 This book also stands out with its more circumspect approach to the myth and reality of Chivalry. Jones writes for an audience that has some familiarity with the basic concepts of European history, which is accessible to newer readers. Writing general non-fiction is a tricky business and Jones navigates the peculiar restraints of the genre admirably. Osprey is a popular publisher of military history and Jones maintains a decent balance that favors that military aspect. It was the original purpose of the Knightly class, but he does not neglect the various social, political, and cultural influences and motivations that shaped Chivalry over time. Content is divided into thematic chapters that maintain a focus on the martial aspects of Chivalry and the mounted warrior. Individual chapters focus on arms and armor, campaigns and tactics, individual skills in arms and the tournament, the knight in society and the eventual ‘decline’ of the knight as a military elite and as a social class. These chapters are not strictly discreet, and this is necessary as Jones attempts to cover, in consistent depth, the full extent of Chivalry across Europe from the ninth- to seventeenth-century. Jones does his best to avoid repetition, a risk when he works in a less than linear fashion. The book is profusely illustrated and is broken up with smaller studies, separate from the main text, focused on specific events, notable persons, or political and religious issues. The introduction is a fine example of the careful qualifications necessary for this type of survey and Jones avoids simplifying the problems inherent in the topic. Here the reader is prepared for the complexities to come and Jones maintains this cautious approach throughout, with the occasional lapse. The medieval fight-text genre — previously the domain of German scholarship but increasingly the focus of English study — has begun to appear in studies of martial elites and rarely appeared in comprehensive studies of knights and Chivalry until very recently. Jones incorporates this material in his chapter on weapons and the chapter on martial skills, training, and tournaments. However, Jones’ use of these new sources leads to some unsafe generalizations about training practices. Jones, In a brief discussion of MS I.33 — an early fourteenth-century fight-text now at the Royal Armouries, Leeds featuring a cleric and monk engaged in sword and buckler training — mentions the “fantastic stories that the monk is a real figure, a retired knight turned warrior monk” a theory Jones thinks worthy only of modern fiction (43). This is not quite the anachronistic error Jones suggests, having appeared first in the 1579 work of Henrici Gunterrodt. Jones also claims, with uncharacteristic certainty, that medieval squire “must” have begun training with wrestling and practiced swordsmanship against the ‘pell’ or pelas, the fixed stake mentioned in Vegetius (84). Young warriors may have done these things, but Jones is rather more confident in this particular claim than his sources actually allow. This is a minor lapse in Jones otherwise commendable academic diligence. Such errors, such as they are, appear often by accident when writing any general survey or when writing about a historical topic with its own internal gaps. This is magnified when working with such a complex topic as Chivalry. Jones is at his best when discussing the complex relationships between the social demands of an elite martial culture and the practical requirements of military operations. The chapters that treat tactics, organization of armies and their management is a clean summary of the conflicting military and social influences that had to be negotiated amongst these elites. The conflicted nature of Chivalric behavior is a key part of Jones’ history. That shifting definitions of rules for chivalric behavior and the people who fell under its protection is dealt with in detail. The history of Chivalry and the knight is built from those layered perspectives and Jones frequently discusses the ways knights described themselves, how others around them understood their place and duties, and how they actually behaved in peace and war. There are some minor issues with the text, but these were likely beyond the author’s control. There are several editorial errors that should have been caught by the publisher. Some sections seem rushed and Jones prose, usually workmanlike and easily followed, on occasion drifts into awkward academic idiom. The reader may get the impression that some parts of the text were rushed and received less attention by the author or editors. Jones is limited in many ways by the demands of this genre and editorial direction. The book lacks even basic references, with rare exceptions. Jones does add a short bibliography of selected reading but some readers may find the lack of detailed attributions for the images an irritation. The publisher has taken many of the illustrations from commercial image sources and they are given their due credit, but the specific manuscript and artifacts themselves are rarely identified specifically. This limits the readers ability to follow-up on sources or seek greater detail in future reading. What flaws there are in this ambitious book are largely the fault of the genre but readers will not be surprised by this. Jones provides an accessible, readable, and admirably balanced, history of a very complex and challenging topic. It would be difficult for anyone to improve on this work, working within the same constraints. Henric Gunterrodt, (1579). De Veris Principiis Artis Dimicatoriae: Tractatus Breivus. (Witenburg: Matthaus Welack). Gunterrodt is quoted at length in Jeffrey L. Forgeng, (2003). The Medieval Art of Swordsmanship: A Facsimile & Translation of Europe’s Oldest Personal Combat Treatise, Royal Armouries MS. I.33. (Union City, CA. and Leeds: Chivalry Bookshelf and The Royal Armouries), 5-6. This entry was posted in BookReview and tagged chivalry. Bookmark the permalink. Pingback: 2012 review | Pen, Book, Sword.